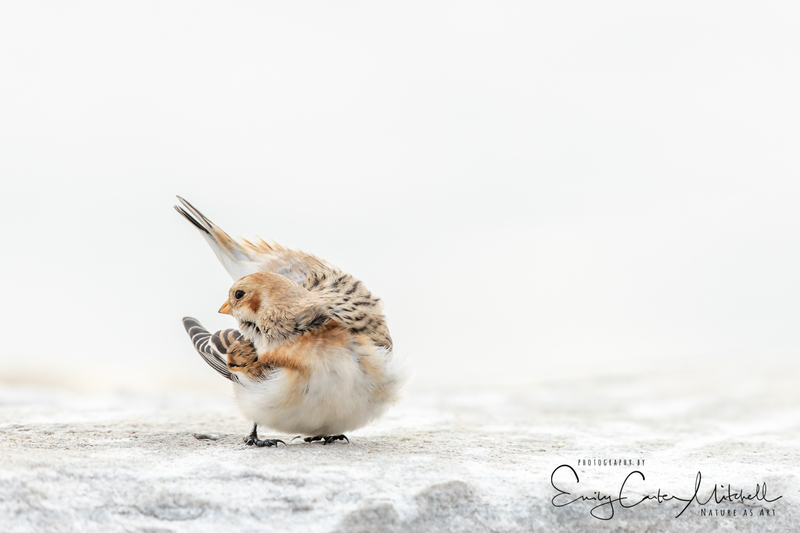 Perhaps one of my most favorite birds to find and spend time with are the charming and sweet Snow Buntings. 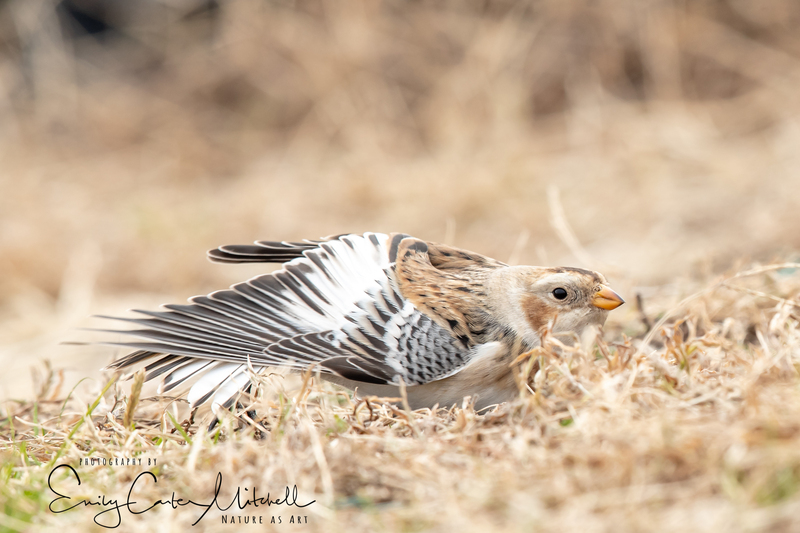 Nothing more says that winter is here then the arrival of a few of these beauties at North Point State Park in Edgemere, Maryland. Their favorite hangout spot is chilly to say the least. Out on a long rip-rap and bricked fishing pier they favor the grassy edges and nibble on the little grass seeds. This year four of them arrived just this past week. Dressing in layers, winter shoes, new Aviator Rabbit fur lined hat and hand warmers in my pocket I ventured out on the 25 degree day. Being on the water is always much colder than expected and if there’s a wind the cold just cuts right through you. 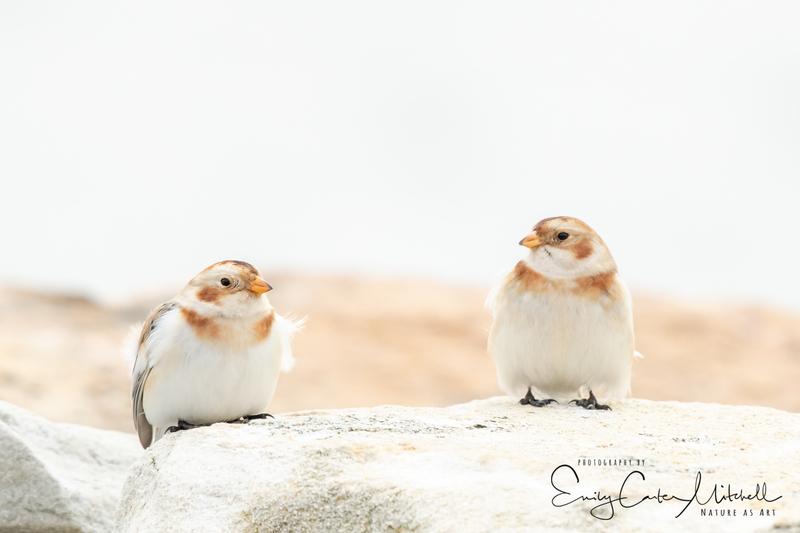 It was a lovely soft-box light morning and upon my arrival I looked and looked for them using my binoculars. I didn’t see a thing other than many far away ducks and a song sparrow. But I didn’t despair and continued to the end where at last I found them. Sitting on the ground I waited for them to be accustomed to my presence. These are quite calm birds and as long as one stays quiet and still they will continue their foraging without a care in the world. Spending over an hour with them all by myself they sometimes got so close that I was unable to focus on them with my camera. Other times they bounded onto the rocks and posed for me. It’s as if they knew it was portrait time. With the past six years of bird photography it’s wonderful to see how my skills of capturing our feathered friends has improved. 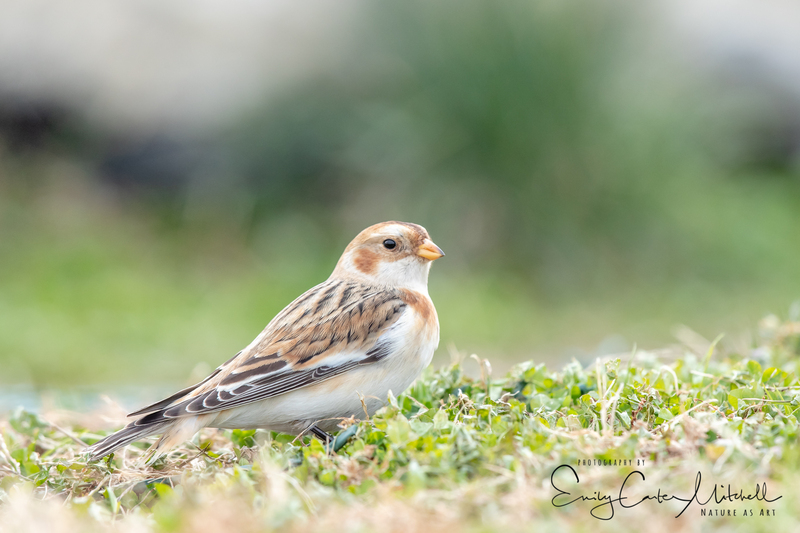 If you search under Snow Bunting on my blog you’ll see how I’ve been following them since 2012. Along with my blog, I’ve been using Flickr as an image repository and when I capture a new image of a bird species I’m now going in and deleting the old images. When I do I realize how all of the practice I’ve done over the years have truly paid off. Certainly when I began, there was very few people that taught bird photography as a skilled art. For those of you just starting out, you are so fortunate to have many resources now available to you to dramatically improve your skills. If you’re local, I’m offering a bird photography workshop in Washington DC. Wintering Waterfowl will be a great beginning field photography workshop which will help you dramatically improve your bird photography skills. Hope to see you there! Lovely. They are definitely posing for you. My favorite has to be the last one. She (?) looks like she is dancing. Isn’t than an amazing pose. These are the sweetest birds I’ve ever met Karen. Thank you. Didn’t realize the buntings had arrived in Maryland already. Your photos of them are simply superb. The ground level shots with perfect exposure speaks to your skills. I hope to get better shots of this bird this year. Thanks. As I’m sure you will. Is you search on my blog Bunting you’ll see the progressive years and when they are usually seen. The don’t stay too long. Good luck !! Sweet captures of this softly colored bird. We don’t see them much here, probably as we are more wooded. From what I read, it’ll be a good winter for irruptive species from the north. How cool that the birds got that close to you! I love taking pics of birds, too! Great shots! These are wonderfully cooperative birds which is rare. Thank you Calcutta. That is true Eliza. When they are found here in Maryland they are usually near a beach or water. They tend to return to this same odd rip-rap paved ‘dock’ that extends out into the bay. There are small planted grass patches that run down on each side of the walkway. They like the seedheads of this type of landscaping grass evidently. There are now 13 of them. Most that I’ve heard of in recent years. Great blog, Emily. I am eagerly awaiting their arrival here in the Midwest.